The second largest city in Thailand, Chiang Mai is the former seat of the Lanna Kingdom and a beautiful laid-back hill station. Featuring several Buddhist temples that draw a lot of attention throughout the year, Chiang Mai is lined with lush green countryside and pristine rainforests that are dotted with beautiful waterfalls, elephant sanctuaries, and local markets that are bustling with life. The city is full of culture, delicious food, and stunning landscapes – great ingredients for a family vacation! The chilly weather and famous celebration of the local Loy Krathong and Yee Peng festivals make this period an ideal time to visit the city. Loy Krathong translates to “float a basket” and the festival takes place every year in November. During this festival, a krathong is decorated with banana leaves, incense sticks, and a candle and are launched in a water body while making a wish. This is believed to wash away your sins and carry your wishes as it sails down the water. The Yee Peng festival is a lantern festival wherein locals release thousands of lanterns into the sky as a means of good fortune. The city looks breath-taking during this time, decked up with atmospheric candles and lights. 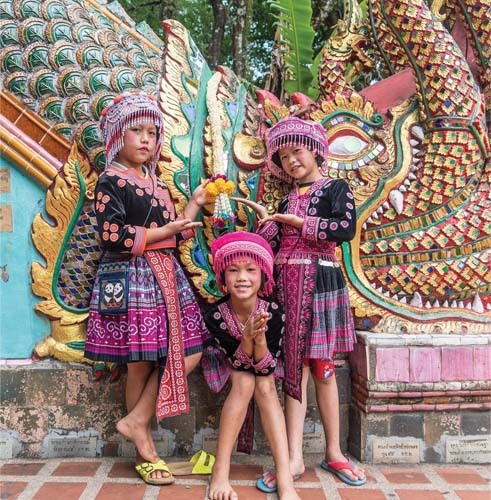 Best time to visit: Most people enjoy Chiang Mai in the winter season, as the city features cooler weather at this time compared to other parts of Thailand, and the humidity is lower as well. The best months to visit are generally between October to February. How to get there: Several domestic and international airlines have direct flights to Chiang Mai International Airport. However, travelling by train is a cheaper option. You can also get there by bus, if you don’t mind the longer transit time.